Since the times of the Romans, preserving meat as sausages has been a tradition around the world, with bratwurst and mettwurst, or brats and metts, just two of many varieties. Like all types of sausages, brats and metts come in a range of types, raw and cooked, made with different ingredients, such as pork, beef or veal, or with different ingredients added -- for example, cheese-filled metts. That said, there are lots of similarities, but some typical differences between the two sausages. You can typically find bratwurst fresh in the supermarket, made with both pork and veal; you may also find it precooked and made just with pork. Bratts are typically mild in flavor, with spices such as ginger, nutmeg, and caraway. Metts are made with pork or sometimes beef and pork, and are highly seasoned with pepper and coriander. Metts are cured and smoked so you can eat them either raw or cooked. Even when bratwurst are precooked, they are always reheated before eating. Metts can either be cooked for the firm, sausage-like types or spread on bread or crackers for soft, liverwurst types. In Cincinnati, a city known for sausages, metts are similar to, or are sometimes confused with, Polish kielbasa sausages, which are firm sausages flavored with garlic, pimento and cloves. The German term for metts is "schmierwurst," because you are able to smear or spread them. Bratwurst and the firm type of metts cook in the same ways, either grilled, pan-fried, poached, stewed or baked. Parboiling the wursts in beer for about five minutes before finishing cooking is also a common method. 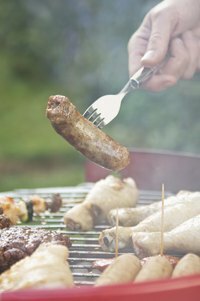 A caution: use tongs when cooking so all the juices remain within the casing, unless you prefer to let the fats in the sausages escape. Like all sausages, brats and metts share many of the same accompaniments and condiments. Mustard and sauerkraut are one typical pairing for the sausages. In stews you might see pairings of the sausages with onions, potatoes and tomatoes or with white beans and carrots seasoned with thyme or oregano. In Chicago, a favorite pairing is sausages with either green or red bell peppers and onions.